The Department of German at Williams College offers an integrated approach to the study of language, literature, and culture. Our curriculum offers students the opportunity to explore German-speaking Europe’s extraordinarily rich cultural tradition, one that has thoroughly influenced many fields ranging from philosophy to music, theatre, art history, linguistics, history, psychology and sociology. Today, Germany is one of the leading countries in the European Union, and all three German-speaking countries are actively engaged with the exciting new heterogeneity of Europe. The department’s faculty members pursue an interdisciplinary research agenda and participate in several programs on campus, including Comparative Literature, Women’s Studies and International Studies. The Department offers a major in German Studies and a Certificate in German. The major consists of ten courses, counting all language courses and the Certificate consists of seven courses. Students are asked to complete their major requirements with at least two German-related courses from other fields. Our course sizes are small which allows for close student-faculty contact. Independent study courses and tutorials are available on a regular basis. Students are matched with a faculty advisor who helps them select courses and pursue their intellectual interests. In consultation with the department, students may choose a senior thesis project based on their research interests. We strongly encourage all our students to take a Goethe Institute or other language immersion course, and to spend a semester or the entire junior year in a German-speaking country. We offer personalized advising for study abroad, and our contacts at the universities of Regensburg in Bayern and Graz in Austria are willing to help with placement and housing. 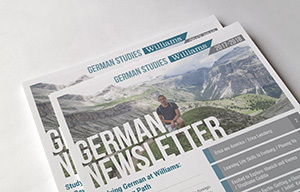 Recent Williams students have studied in Berlin, Wien, München, Tübingen and Hamburg. Teaching Associates from Germany and Austria join us every year to teach conversation sections of the language courses and run German-related activities and events, ranging from excursions to the Neue Galerie New York to see expressionist art or the Tenement Museum to learn about German-American immigrant families to chocolate tasting and “Grillabend,” our version of a cookout.